Winter is here again; cold and sickening. The winter gale is sweeping across the streets and into your house bringing with it coldness that makes you freeze in your sheets. It is during these times when you need every bit of warmth you can put your hands on. You will need to warm your house to make it habitable both for you and your family. While there are many ways of warming a house, firewood has always been one of the people’s favorite. Mostly available in form of huge logs, you will need to split these logs of wood to make them small and fit your furnace. Splitting these logs of wood is not an easy task especially when you are using crude devices like axe. An axe is tiresome and requires you to apply lots of energy. It is therefore ideal for you to use a log splitter, a device that will split your logs within minutes and leave you with sizeable pieces of wood to fit your furnace. A log splitter is a machine that is used to split hardwood or softwood logs which have been already cut into round sections into firewood that can fit the furnace. These pre-cut sections are usually cut on a saw bench or chainsaw but their huge size cannot fit the furnace. It is therefore required that they be split into small pieces which can be burnt to provide heat. Most log splitters are comprised of an electric or hydraulic piston and rod assembly and they are mostly rated according to the tons of force that they produce. Log splitters with high pressure ratings can split logs with great thickness and length. Most home use log splitters have a 10 tons rating. Many people who use log splitters for home use have less number of logs to split and do it less often than commercial purposes who need stronger log splitters that can handle tons of logs. Commercial log splitters are rated at around 25 tons of force and can handle large rounds of logs. Manual log splitters apply mechanical leverage where logs are forced into a sharpened blade assembly which splits the logs. Screw or corkscrew log splitters are attached to an agricultural tractor’s three point linkage on the power take-off of the tractor. Though log splitters and firewood processors do more or less the same work of producing firewood from huge pieces of wood, there are many key differences between these two equipment. 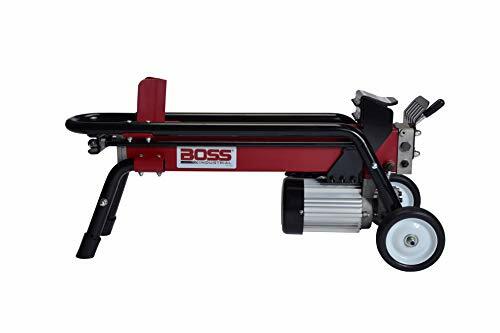 There are instances that call for use of log splitter such as splitting a few rounds of wood for home consumption while other instances like splitting large amounts of rounds of wood daily require a firewood processor. Here are the real differences between these two equipment. Length of wood and diameter – A log splitter handles relatively shorter logs of wood extending about 18 to 2 inches. Firewood processors on the other hand are designed to handle longer pieces of wood and can handle rounds of wood with a diameter of 16 inches. Home-use vs. commercial use – Log splitters handle less amount of wood as compared to firewood processors. Log splitters are ideal for the homeowners who need to split firewood to warm their houses. On the other hand, firewood processors are used by industries and commercial establishments which require large amounts of firewood to provide their energy requirements or sell to other consumers. Cost – Log splitters are inexpensive and you can get one from around $100 to $2000. Firewood processors are on the other hand very expensive and you should be prepared to cough out some tens of thousands of dollars to acquire one. Amount of firewood – A log splitter handles a few tons of firewood at a time. They are ideal for producing firewood for home use. Firewood processors however, are designed to handle large amounts of firewood at a time. They can produce between 2 to 4 cords of firewood in one hour. It is therefore very important for you to determine the amount of firewood and how often you want it before committing yourself to buying any of these equipment. There are different brands of log splitters in the market today. These manufacturers promise you quality and performance but often bring you sub-standard log splitters. However, there are those who do not eat their words, and bring you exactly what they promised you. Here is the top 4 review of the top log splitters. Boss Industrial ES7T20 offers you portability and a one handed operation. It comes with automatic RAM return function which enables you to work faster. This guy has a rugged design appearance and professional grade hydraulics as well as qualify finishing and craftsmanship which is geared towards ensuring that your wood splitting properties are not compromised.
. When you remove your hand from the machine during log splitting the automatic RAM return takes place meaning you will not be exposed to any danger. The professional grade hydraulic system is your best bet to splitting those pieces of wood for your fireplace firewood. 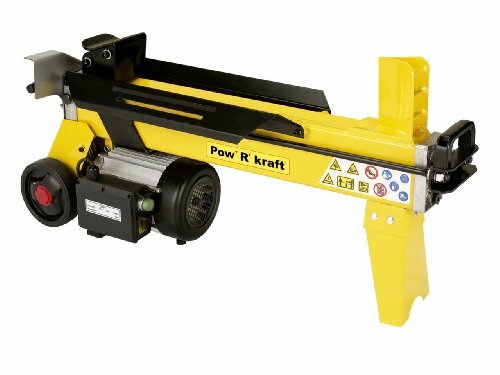 The 15 Amp, 4 ton 1.75 HP electric motor provides just the right amount of energy to make splitting of logs easier using this Pow’ R’ Kraft. This big guy can splits huge logs measuring up to 20 inches in length and 10 inches in diameter. This guy comes with two handed operations which allow you to keep your hands busy on other things and enables for clear cutting of firewood. This guy is all-steel constructed making him very tough and durable giving you a long lifespan of service. This electric log splitter runs on a 1500 watt electric motor which operates on the regular home current. It has a fault breaker that protects it from current overload. Handles up to 20 inches long and 12 inches diameter in most woods. WEN 56206 6-Ton Electric Log Splitter is the one log splitter that turns rounds of wood into firewood with great ease. This log splitter is very safe and more effective than swinging an axe. This big guy is all steel constructed and handles all your household firewood needs with ease. 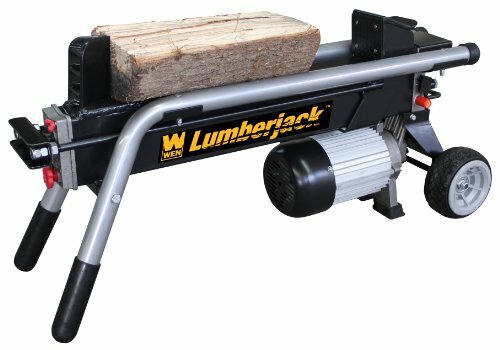 This guy comes with a 15 Amp 2HP motor that produces 12000 pounds force that splits any log of wood of up to 20.5 inches length and 10 inches in diameter. It also comes with a 4 by 4 inches push plate that pushes logs into the wedge where the wood is split. WEN log splitter is designed for use by both hands. To ensure maximum safety, when you remove one hand the RAM returns to the start point meaning there is no body harm danger. This guy doesn’t need any gas or batteries. You just plug it in on the power socket and you are ready to go. This log splitter comes handy with two cozy grip handles as well as 6 inch tires that facilitate easy transport to your workplace. You can use a 50 inch 12—gauge extension cord and AW32 hydraulic oil in the 2.8 quart tank. Champion Power Equipment is the real champion when it comes to splitting logs for your household use. Gas log splitters are known as the most powerful log splitters and this is confirmed by the 25 tons of force produced by this Champion guy. This log splitter combines power and speed to give you probably the best log splitting performance from a log splitter. It comes with a 23 inches by 4 inches hydraulic cylinder, 11 gallon per minute pump 2 stage hydraulic which produces a pressure of 3900 psi. Integrated log cradle and 14 second no load cycle time can handle logs of up to 24 inches long weighing about 100 lbs. This log splitter has DOT approved tires, 2 inch ball hitch, spin on oil filter and 16 gallon hydraulic oil capacity. It can operate either horizontally or vertically and is powered by a Champion 196 OHV engine that has a cast iron sleeve with low oil shutdown and one gallon gas tank. Besides enjoying Champions Lifetime Free Technical Support, you will also enjoy a one year limited warranty on this log splitter. So, what features really make the difference in log splitters? This is the one million dollar question you have to answer before purchasing a log splitter. Here are the decisive features to look out for if you really want to make a wise investment. A log splitter should be strong enough to split wet and hard wood without a strain. You should therefore, check out log splitters that are strong and powerful enough to go through some of the toughest and knottiest wood. To do this, check the RAM splitting force, total horsepower and Amps. Go for the one that is strong enough to solve your firewood needs. The log length and diameter that you choice of machine can accept will also be a key factor in determining the amount of work that your log splitter can handle. It is advisable that you choose a log splitter that offers more room than one with limited room. A log splitter that accepts large lengths and diameters approximately 20 inches by 12 inches respectively is the best splitter. Portability is another factor that separates chaff from wheat. These achiness are heavy and therefore not ideal to carry around on your shoulders or at the back of your truck. Machines that are portable are easier to handle, thus more effective. Choose splitters with wheels. This will make it easy for you to move it from the store to the fields. You also can move it all by yourself. There are cases when you need to tow the splitter. Most log splitters have ball hitches for towing thus making them portable. A fast cycle time means more work done in less time. The common cycle time is 15 seconds and this is quite acceptable and respected. Cycle time plays a major role in log splitter productivity and efficiency. Cycle time refers to the time taken by the ram to go back to the starting point after one split. Go for a log splitter that has faster cycle time as it will handle more work within less time. If you want to buy a log splitter, then make sure you get one that will give your many years of wood splitting without a fuse. This means getting a durable and long lasting log splitter, and which other material would give you better service than all steel construction. Ensure the log splitter you choose is all steel construction to assure you of a long trouble free service. Want to capitalize on other user experience? Then get a log splitter with at least a year of warranty. Second, go for the reviews. There are numerous sites that offer you consumer reviews, such as Amazon.com. Read these reviews and try to identify the aspects of the log splitter that made the users happy and those that didn’t. 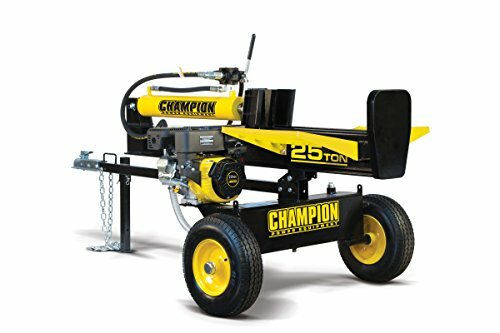 Amazon.com reviews are some of the most detailed and informative reviews that will give you a clear insight of the log splitter you want to buy. Finally, go for a log splitter from a reputable manufacturer. Some manufacturers are out to make a killing while others specialize on quality products. Reputable manufacturers such as Pow ‘R’ Kraft will be a wiser buy. Planning to buy a log splitter? Well, you now have all the information you need at your fingertips. Before deciding on the type of log splitter to buy, first ensure you know the amount of work you want to do with the splitter. Then decide on the type of log splitter to buy. Gas log splitters are the most powerful but expensive. A manual log splitter is ideal for low amount of work and especially in places with unreliable electrical energy. If gas fuel will be a problem to you, go for an electrical or hydraulic log splitter. After all, gas is more expensive and produces harsh fumes that won’t be ideal especially if you plan to use the log splitter from your garage or store. Take time to figure out the log splitter that will be most useful to you. You too know the key factor to consider when choosing the best log splitter. By all means, go for a powerful motor which will be equal to any task. At times, you will split the knottiest rounds of wood and thus require a motor that can get through such knots. Durability is also a major factor. You don’t want to invest several hundreds of dollars in a machine that will only live for a few years. Now that you have all the tips you need to know about log splitters, it’s now your call to make the decision.